While Albus NoX Luna finally bow out. The group stages may have been wild and unpredictable, but things got back to normal at the League of Legends World Championship quarterfinals this weekend as all the Korean teams won and luck ran out for fan-favourite wildcard team Albus NoX Luna. Naturally, three Korean teams in the semis meant it was meme o'clock in social city. The quarterfinals began with Cloud9 bowing out as North America's final representative in a pretty one-sided series against Samsung Galaxy. C9 hadn't looked that good in groups anyway and were thoroughly found out by a Galaxy side in the ascendant. If that felt like North America being put in its place, though, the next two quarterfinals were just as punishing for Chinese fans. 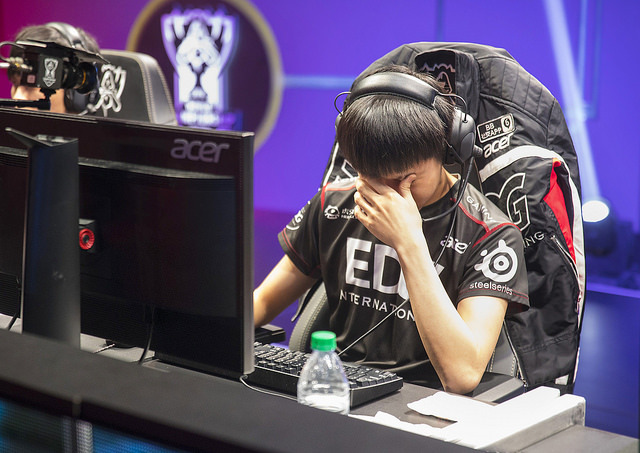 EDward Gaming go out at the quarterfinal for the second year in a row after losing to Fnatic in 2015. Friday's match between reigning world champions SK Telecom T1 and Royal Never Give Up began promisingly, as the Chinese team punished a slow start from their illustrious opponents and managed to begin the series with a win. Unfortunately for RNG, SKT then woke up and responded with three slick victories to take the series 3-1, with Faker looking particularly good, even when RNG managed to grab Aurelion Sol for xiaohu. That's worrying news for ROX Tigers, who will have to face off against Faker in a semifinal this weekend after they battered EDward Gaming 3-1 in the next matchup, only dropping a game when Smeb went for style points by picking Fiora and it didn't work out. There were a few signs of life now and then, but overall Chinese fans - like their North American counterparts - will probably head home from Worlds wondering whether their region had been a bit overhyped heading into the tournament. Two teams that had been serially underhyped, meanwhile, were the EU LCS's H2K Gaming and wildcard Albus NoX Luna, who played last night. ANX were the darlings of the group stages, claiming four victories, including the scalp of ROX Tigers in the game of the tournament so far, but whatever luck they were channelling was finally exhausted by their experienced European opposition, who ran out 3-0 victors. ANX didn't help themselves by letting H2K have pretty much the same picks in all three games, despite getting stomped in the first two, but without wishing to patronise them, their legacy in this tournament will be teaching everyone else to take wildcard teams seriously. As for H2K, nobody expected them to get this far and there are still question marks about some of their late-game decisions, but EU fans will be happy enough to see one of their teams in the semifinals for the second year running after Fnatic and Origen's big runs last year. Seeing @H2KGG & @pr0llyLOL succeed is heart warming. This team has had countless difficulties this year, but showed up on the biggest stage. The four remaining teams will now face off in semifinal matches at Madison Square Garden in New York City this weekend. SK Telecom T1 will play ROX Tigers on Friday night in a rerun of last year's grand final, and H2K Gaming will face Samsung Galaxy on Saturday. It's hard to look past the three Korean teams when predicting this year's world champion, and some might even argue that SKT vs. ROX is the de facto grand final anyway, but after a quarterfinal round that played out pretty much as expected, a little chaos at the Garden wouldn't be unwelcome. H2what?